Happy Monday everyone! Every morning this week, I’ll be running a series of guests posts about different printing methods – so if you’ve ever wondered why certain printing methods are best for certain kinds of designs (or cost more than others), this is for you! You can read the previous installments covering digital printing, engraving, screen printing, letterpress printing with antique type, and foil stamping all right here. Today we have the talented Katharine Watson stopping by to tell us about one of the oldest printing methods – a technique known as block printing. Block Printing is one of the oldest types of printmaking, and has been around for thousands of years. There is evidence that it existed as early as the fifth century BC, with actual fragments found from as early as the fifteenth century. It has been done around the world, with roots in India, China and Japan. Since there is such a long history of block printing, there are many different techniques, but it is essentially using a carved material covered in ink to transfer an image on to paper or fabric. Block printing can be done with wood, linoleum, rubber, or many other materials, but I use linoleum for my work. Images that are printed with this technique are typically much bolder than other types of printmaking: since the blocks are carved by hand, there is often less detail and more texture to the prints. It is possible however, when using a very small knife, to carve blocks with a huge amount of detail. 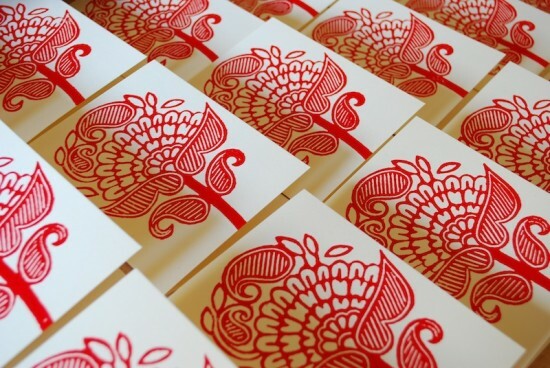 Block printing is also known as “relief printing” because the ink leaves a raised texture on the paper. This is different than letterpress where the image is applied with enough pressure to leave an indent on the paper; typically block printing is done by hand, so the ink sits on the surface adding a raised texture to the paper. The first step is to sketch the design. It is important to reverse the image if you are using text, as the printed image will be the reverse of what is on the block. Once I have the image ready, I then transfer the design on to the linoleum to give me an outline of where to carve. The next step is to carve the design. I carve away the parts that I don’t want to print, as the ink will be applied to the raised surfaces to print the design. Whatever surface is untouched will be what prints onto the paper. Carving a block can take anywhere from an hour for a small piece, to several weeks or even months depending on the size and detail of the image. I use a range of knives, with very small-tipped knives for carving outlines and details, and much larger ones for cutting away the background. Carving the blocks takes a lot of patience, because if your hand slips it can ruin the whole piece. With practice, you can learn the amount of pressure it takes to carve the material, and the best techniques to use for certain designs. Once the block is carved, I trim the excess off with scissors to give it a straight edge, and then it is ready for printing. There are many different types of ink on the market, and it’s important to test them out to find the best one. I use oil-based inks because they give the best even coverage and print well on both fabric and paper, but there are lots of options out there. To print, I squeeze a small amount of ink onto a piece of glass or plexiglass, and roll it out with a roller (also called a brayer). I do this to get a thin, even layer, because it’s important to apply the ink evenly to the block. I then roll the ink on to the block, making sure there is a thin but even layer on the whole design. Then I take the block and press it down onto the paper or fabric. You can do this with your hands, a printing barren (a specific tool to apply pressure to a block), a rolling pin, by walking on it, or with a printing press – whatever it takes to apply even pressure. The most important part is applying the pressure evenly, since the color will be stronger in some areas of the print than others if uneven pressure is applied. This is also a step that takes some practice and perfecting. The ink then takes several days to dry, so unlike other printing processes, there is a long wait time before the prints are ready to use. The oil based inks can take from two days to a week to fully dry, whereas water-based inks will dry slightly faster. The inks are made to dry slowly so that you are able to print without having the ink dry on the block; if you print with a fast-drying ink or paint, it will sometimes start to dry before you have even finished the print, giving a very uneven coverage. I love block printing because of the bold and simple designs that can be created, but that simplicity takes a lot of steps to achieve. The technique is excellent for images with just a few colors and fewer details, but can be difficult to use for images with lots of small text, or very fine details that tend to break off the block with too many uses. One of the advantages of block printing is that it can be done on a surface of almost any size and texture. I print on fabric, paper, canvas, wood and other materials, and you don’t have to worry about fitting it through a printer or a press. Block printing is also an excellent way to produce a something that is truly handmade, but can be very easily replicated. Carving the block is time consuming and requires a lot of patience, but once you have the block you can use it hundreds or thousands of times. Block printing is also one of the easiest printing methods to get started with, since the materials needed to start are relatively inexpensive, and you don’t need a lot of equipment for printing. It’s a great way to get into printmaking! Thanks Katharine! Check out more of Katharine’s beautiful work right here! I love carving SO much. I wish I could bypass my shoulder injury to do more of it. What a lovely set of prints and adore the documentation of the process. It might be historical but this technique is beautiful and refreshing. Thanks for sharing! This has inspired me to finish my block print that i started in july. Mine is of poppies that are very detailed. My first prints did not turn out well. Now i need to touch up my block and continue. This was a very helpful tutorial and has me motivated to complete my work. Just what I needed – to see each of the steps. I have a lino cutter and a few blocks but needed a refresher from my high school art days. Can’t wait to try now! Thanks! This post has really inspired me to try this out! It would be a wonderful way to get into printmaking indeed. Thanks for the detailed explanations, showing every step & tool you use. i was first introduced to block printing when i was living in india. its such an amazing process–i love every step. thanks for sharing!